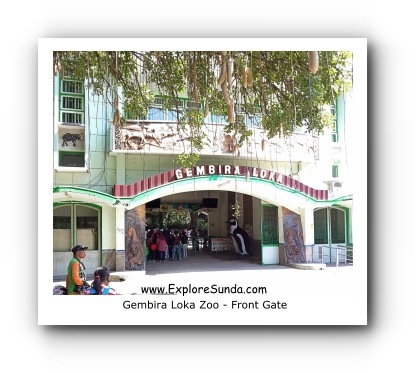 Gembira Loka Zoo in Jogjakarta is one of the best zoos in Indonesia. The zoo is well maintained, people enjoy visit it to see the wild animals, watch performances of the trained animals, and take some rides. These little penguins are from South Africa. Despite of their small body, they are called jackass because their cries similar to male donkey. Their feet are black, hence, they also known as black-footed penguin. 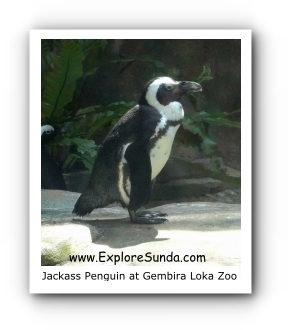 These African penguins are the highlight of Gembira Loka Zoo during our visit in June 2015. Their habitat is in the back of the zoo, at the bird park. 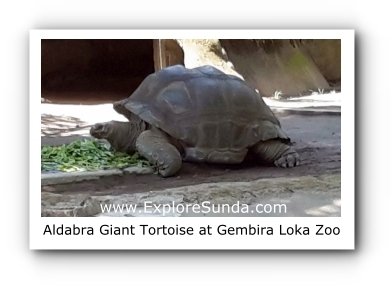 The visitors can watch the zoo keeper feed them at 9.30 and 13.00.
from the Aldabra atoll in Seychelles. This giant tortoise is one of the largest tortoises in the world. We also can see other wild animals such as orang utan, chimpanzee, sun bears, crocodiles, tigers, elephants, deer, horses, ostrich, porcupine and many varieties of birds. They all have their own habitats. One thing I wonder is why most of the habitats’ ground are made of cements. Won’t it be too harsh for the animals? Perhaps if these wild animals can live in the more natural habitat they can be more comfortable. 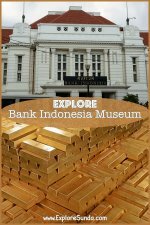 The most attractive habitat we, at the ExploreSunda.com, found is the Bird Park, also known as the Bird Kingdom. We found many varieties of birds there, including many birds of prey such as eagle and owl. The best part of this bird park is the habitat where we can walk inside the dome and birds fly freely there. The zoo keeper provides free food in small cups at the entrance. We take them inside and feed lory birds. It’s so much fun! The lory birds are very used to humans feeding them, so they will come near you as soon as they spot the cups in your hands. Then they eat greedily. Fun facts: Can you guess what food we give to those birds? It’s baby food! In addition to observing wild animals in their habitats, we also can see performances of some of the trained animals and watch the zoo keeper feed penguins, tigers, chimpanzee, arapaima, snake, and little black cormorant seabird. The show and some of the animal feeds don’t occur everyday, hence, the best time to watch them is during weekends or national holidays. The only downside is the zoo will be crowded. 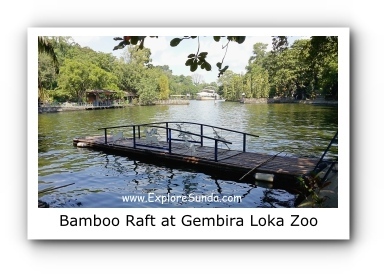 Gembira Loka has a huge man-made lake in the center of the zoo. A boat called Mayang Tirta docked at one of the lake side. We can dine and hang out here. Perahu katamaran, a big boat that carries many passengers to sail around the lake. At the corner of the lake we also can rent a pedalling boat, in the shape of the swan. Cross the lake using a bamboo raft. If you prefer to ride an ATV, you will find the track near the east entrance gate. Instead of a horse ride, Gembira Loka offers an elephant ride and camel ride. Too bad we only circle a small track. 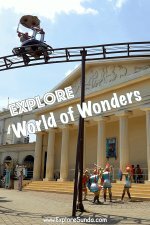 We, at the ExploreSunda.com, prefers the elephant ride in Taman Safari Indonesia. 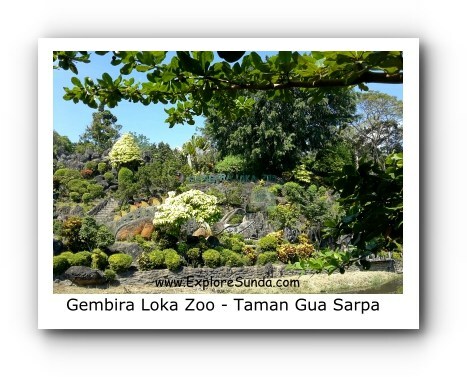 We also can play in the garden called Gua Sarpa. The entrance to the garden is through a tunnel in the form of a dinosaur. 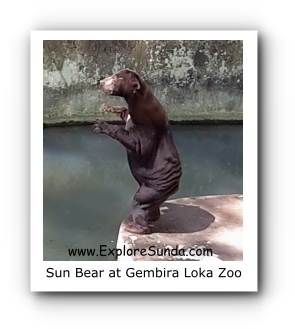 How do you prefer to explore Gembira Loka Zoo? 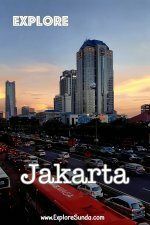 Instead of walking, we can rent a bicycle (they offer tandem bikes too) or ride an open vehicle called Taring (Transportasi Keliling). We can hop on and off Taring on the many stations around the zoo.